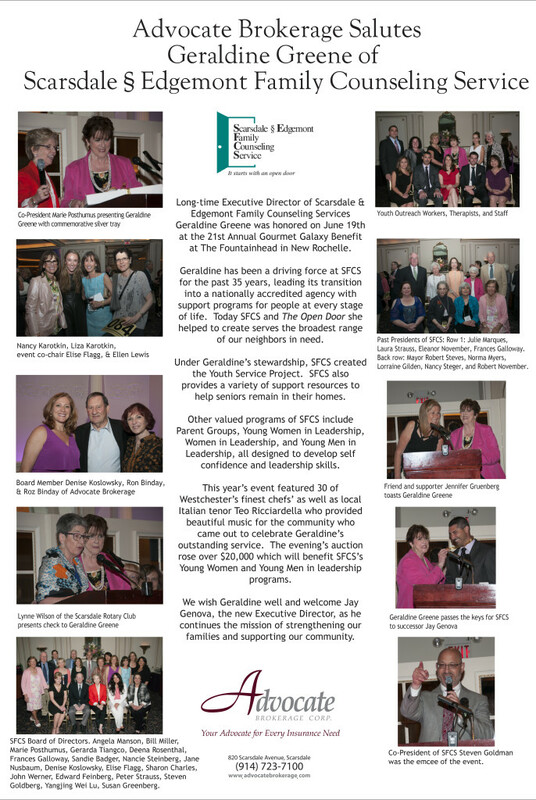 Advocate Salutes Geraldine Greene of SFCS - Scarsdale Premier Insurance Agency | Advocate Brokerage Corp.
Long-time Executive Director of Scarsdale § Edgemont Family Counseling Services, Geraldine Greene, was honored on June 19th at the 21st Annual Gourmet Galaxy Benefit at The Fountainhead in New Rochelle. Geraldine has been a driving force at SFCS for the past 35 years, leading its transition into a nationally accredited agency with support programs for people at every stage of life. Today SFCS and The Open Door she helped to create serves the broadest range of our neighbors in need. Under Geraldine’s stewardship, SFCS created the Youth Service Project. SFCS also provides a variety of support resources to help seniors remain in their homes. Other valued programs of SFCS include Parent Groups, Young Women in Leadership, Women in Leadership, and Young Men in Leadership all designed to build self-confidence and leadership skills. This year’s event featured 30 of Westchester’s finest chefs’ as well as local Italian tenor Teo Ricciardella who provided beautiful music for the community who came out to celebrate Geraldine’s outstanding service. The evening’s auction rose over $20,000 which will benefit SFCS’s Young Women and Young Men in leadership programs. We wish Geraldine well and welcome Jay Genova, the new Executive Director as he continues the mission of strengthening our families and supporting our community.